After strengthening overnight, Tropical Storm Harvey is expected to make landfall on the Texas coast on Friday, bringing the potential for heavy rain over New Orleans and more flooding starting this weekend, officials said. Current forecasts by the National Hurricane Center show Harvey continuing to gain strength into a hurricane as it heads toward the Corpus Christi area of south Texas, making landfall overnight Friday. The system is then expected to hover over the area and slowly drift toward Louisiana until as late as Tuesday, producing uncertain patterns of rain bands that could also dump several inches of rain to New Orleans. 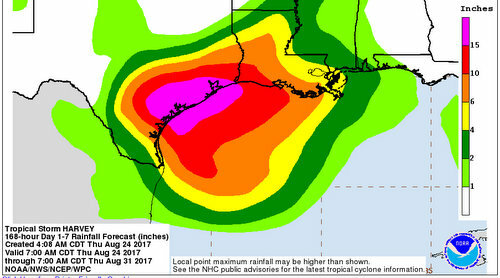 “While it is still very uncertain to the National Weather Service, the latest forecasts show Harvey strengthening by Friday and producing heavy rainfall and potential localized flooding in New Orleans beginning Saturday through mid-week,” Mayor Mitch Landrieu said in a news conference Thursday morning. “Our models will likely change as the system draws closer — they remind us about this every other paragraph. “Current forecasts indicate, over the entire period of the storm, 5 to 10 inches of rain over the duration of event in our geographical location with the potential for double — and this is what worries me the most — for double if we get stuck in prolonged rain bands, which themselves are very unpredictable,” Landrieu said. New Orleans is already about 2 inches of rain away from its all-time record for summer rainfall, and that’s not counting whatever rain Harvey brings, Landrieu noted. But even the National Weather Service is still unsure how the rain will play out over the Gulf Coast, he reiterated. “They can’t see those rain bands clearly at this point in time, so they can’t really predict how large they’re going to be and where they’re going to be,” Landrieu said. The city’s drainage capacity remains diminished, with all but one backup power turbine offline and 15 drainage pumps out of service. The city has secured 26 diesel-powered backup generators, however, and has taken steps to ensure that all pumping stations will be fully staffed during any emergency, the city said. Landrieu emphasized that some of the higher estimates for rain from Harvey would likely cause flooding even if the system was working properly. The city is also clearing as many catch basins as possible, with four vacuum trucks reporting that they have cleaned 800 catch basins since the Aug. 5 floods. This week, the city is reviewing bids for $7 million in additional catch-basin cleaning and $14 million in drain repairs, the report states. Residents are encouraged to clean the openings of their catch basins themselves and call 311 to report any that are clogged. Landrieu has requested that FEMA begin placing as much personnel and equipment in New Orleans as possible in anticipation of possible flooding, the city said. Avoid driving in flooded streets if possible, and if driving is necessary, do so as slowly as possible to prevent pushing water into parked cars or homes, said NOPD Superintendent Michael Harrison. Anyone who needs to park cars on high ground should not do so in the middle of the street, so that emergency vehicles can still pass. The photo of mine does not show properly on this site, but I’m sure you get the picture. Is your drain this clean? 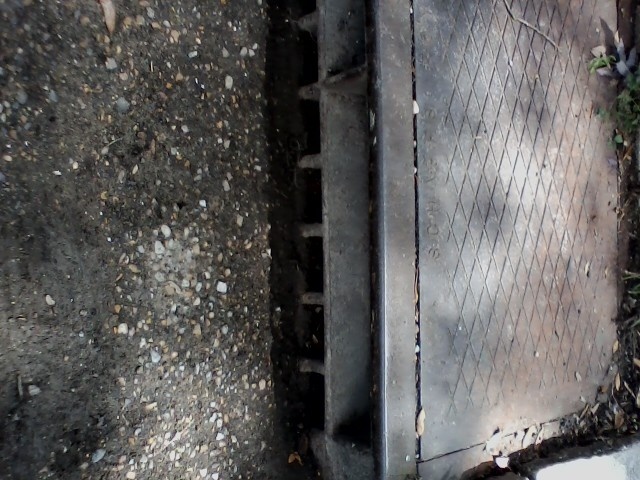 We never flood in this block……the water flows easily into the open grate.